St. Josemaria Escriva was born in 1902 at Barbastro Spain. He was ordained in Saragossa in 1925 and by divine inspiration founded Opus Dei which opened a new way for the faithful to sanctify themselves in the midst of the world. He died on June 26, 1975 and was canonized a saint on October 6, 2002. According to the 1962 Missal of St. John XXIII the Extraordinary Form of the Roman Rite, today is the feast of Sts. John and Paul, martyrs, two brothers, who encouraged each other to remain faithful in their sufferings. They are named in the Roman Canon of the Mass (Eucharistic Prayer I). Historically today is the feast of St. Pelagius of Córdoba, a young boy who chose death rather than submission to the sexual advances or the false religion of the Muslim Caliph of Córdoba. Recently beatified was Bl. Jacques Ghazir Haddad. He was born in Ghazir, in the heart of Lebanon, Capuchin Missionary, he traveled through the mountains preaching and teaching the people to pray. The last twenty-three years of his life were devoted to the apostolate of charity and care of the most abandoned. Thousands of poor people found in care of his Sisters of the Cross comfort and reason to hope. 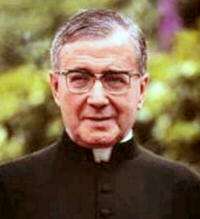 St. Josemaria Escriva was born in Barbastro, Spain, on January 9, 1902. He had five siblings: Carmen (1899-1957) and Santiago (1919-1994) and three younger sisters who died when they were small children. His parents, José and Dolores, gave their children a deep Christian education. On October 2, 1928, during a spiritual retreat, Fr. Josemaria saw what it was that God was asking of him: to found Opus Dei, a way of sanctification in daily work and in the fulfillment of the Christian's ordinary duties. From then on he worked on carrying out this task, meanwhile continuing his priestly ministry, particularly to the poor and the sick. During these early years of Opus Dei, he was also studying at the University of Madrid and teaching classes in order to support his family. When the Civil War broke out in Madrid, religious persecution forced Fr. Josemaria to exercise his priestly ministry clandestinely and to move from place to place seeking refuge. Eventually, he was able to leave the Spanish capital; and, after a harrowing escape across the Pyrenees, he took up residence in Burgos. When the war concluded in 1939, he returned to Madrid and finally obtained his doctorate in law. In the years that followed he gave many retreats to laity, priests, and religious, and continued working assiduously to develop Opus Dei. Ten years later, on October 6, 2002, John Paul II canonized the founder of Opus Dei in St. Peter's Square before a multitude of people from more than 80 countries. In his discourse to those who attended the canonization, the Holy Father said that "St. Josemaria was chosen by the Lord to proclaim the universal call to holiness and to indicate that everyday life, its customary activities, are a path towards holiness. It could be said that he was the saint of the ordinary." Read a longer biography of St. Josemaria. Visit these sites to find out more about Opus Dei, St. Josemaria Escriva and his writings. Visit Opus Dei's official US website. St. Josemaria Escriva’s teachings stressed the universal call to holiness; in fact this is the root of his teaching. Vatican II echoed this in the Dogmatic Constitution on the Church, Lumen Gentium: “It is therefore quite clear that all Christians in any state or walk of life are called to the fullness of Christian life and to the perfection of love, and by this holiness a more human manner of life is fostered also in earthly society” (no. 40). In a document as far back as 1930, for example, St. Josemaria wrote: “Holiness is not something for some privileged few. God calls everyone; from everyone He waits for Love: from everyone, wherever they may be; from everyone, whatever may be their state in life, profession, or occupation.” See the marble structure of the Universal Call to Holiness at the National Shrine of the Immaculate Conception in Washington, DC. Read Francis Cardinal George's comments on this teaching. The Acts of these two martyrs, which historians regard as spurious, contain the following: "The two brothers, John and Paul, were valets to Constantia, the daughter of Emperor Constantine. For their excellent work she bequeathed to them a considerable sum. This they used to aid poor Christians. When Julian the Apostate (361-363) invited them to become members of the inner circle of the imperial household, they refused and boldly explained that they did not relish close association with one who had fallen away from Jesus Christ. The Emperor gave them ten days to reconsider their position, threatening them with death if at the end of this time they refused to do his bidding and sacrifice to Jupiter. The brothers used the interval to distribute what remained of their possessions to the poor so that they could begin their journey home to God with less hindrance, while at the same time benefiting many who would 'receive them into the everlasting dwellings' (Luke 16:9). Their choice was death, and they were beheaded in their own house." Both John and Paul were highly venerated by the Roman Church. They are mentioned in the Canon of the Mass and in the Litany of the Saints. Their particular virtue was love toward the poor. The following, at least, is historically certain: these two court officials were martyred and buried in their own house. Byzas and Pammachius transformed this house into a church dedicated to the two martyrs. Excavations have proven these points. Beneath the church were found their home, the tombs, and the place of execution. St. Pelagius was a thirteen year old Christian who was martyred for refusing to denounce his faith and convert to Islam in Cordoba, Spain in 925. 10th century Cordoba was the most powerful and glorious time in the world for the muslim caliphates and they boasted the largest mosque outside of the Caaba in Mecca. Pelagius, as a ten year old boy, was taken hostage by the Moors of Cordoba during a rampage in a Christian town. He was in captivity for three years and nobody had made any attempt to ransom him. The Emir of Cordoba offered him his freedom if he would convert to Islam. The boy refused and the Emir had him tortured and killed. He is said to have endured six hours of constant excruciating pain until he died. Saint Pelagius is venerated in Leon, Cordoba, and Oviedo, where his relics have been kept since they were transferred there in 985. Read this longer biography of St. Pelagius of Córdoba: A Martyr for our Times. Read more about this Maronite saint here and here. Learn about the order founded by Bl. Haddad at Francisan Sisters of the Cross.